After providing introduction to the new Conversion functions and DATE TIME functions in SQL Server, I come up with analytical functions LAST_VALUE and FIRST_VALUE. LAST_VALUE: As name suggests, this function will return the last value from the ordered set values. FIRST_VALUE: FIRST_VALUE function is also behaving like its name; it returns the first value from the ordered set values. 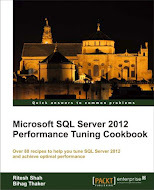 Let us see how it actually works with following simple example which only works in SQL Server 2012. ENJOY new SQL Server with all its power!!!! This entry was posted in FIRST_VALUE, LAST_VALUE, SQL Server 2012 and tagged FIRST_VALUE, LAST_VALUE, sql server 2012 on October 24, 2012 by Riteshshah. Sure, I will put result from now on. Can you PASTE your SQL Code w/o the line #?